This post brought to you by BAND-AID® Brand. All opinions are 100% mine. A house full of little kids means lots of “ouchies” happen in this house. Whether it’s a skinned knee or a stubbed toe, we have more than our fair share around here. Often, my kids aren’t seriously hurt but they need that reassurance that everything will be alright. We have a few tools we keep on hand for all their knicks – including the more serious ones. There’s a few things you can’t be without! Let me share our Boo Boo Kit Essentials and then a super easy 5 minute Boo Boo Bags tutorial! These few basic essentials will cover most boo boo’s! 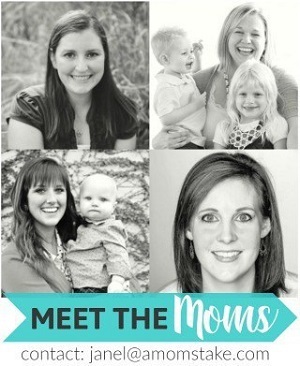 Hugs & Kisses – This goes farther than anything else to comfort your little one! It’s a miracle drug, apply regularly! BAND-AID® Brand – Even without bleeding, my kids always want a BAND-AID® Brand to help them feel better. Super simple fix! Q-tips – Help apply ointments or clean out a wound. Medicines your family frequently might use. We keep a small scar prevention tube on hand. 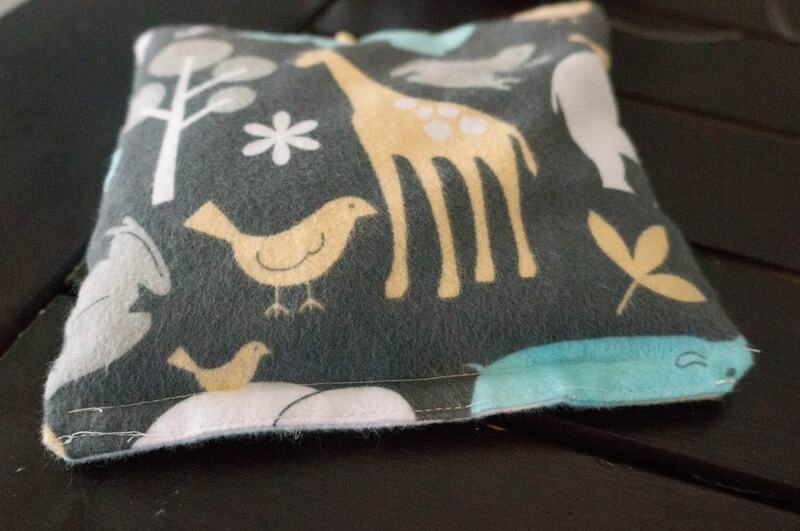 Boo Boo Bags – To comfort your child. 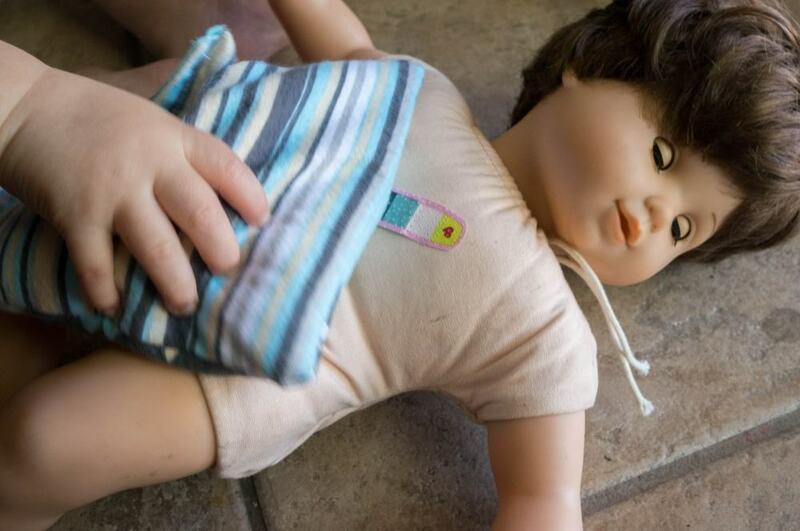 A boo boo bag is just a simple hot/cold rice pack that can be used to help your child when in pain. I use one all the time myself for sore muscles and to relax at night. Kids love them too, even if they don’t really use them for a serious need, it’s a great distraction from their new ouchie. It always amazes me how BAND-AID® BRAND can make everything “all better” even during those times when they don’t need one at all. With kids around 3 and up, style starts to matter! They don’t want a boring, skin-toned BAND-AID® BRAND! They want to show off their ouchie with a favorite character, sports, or other cute design. 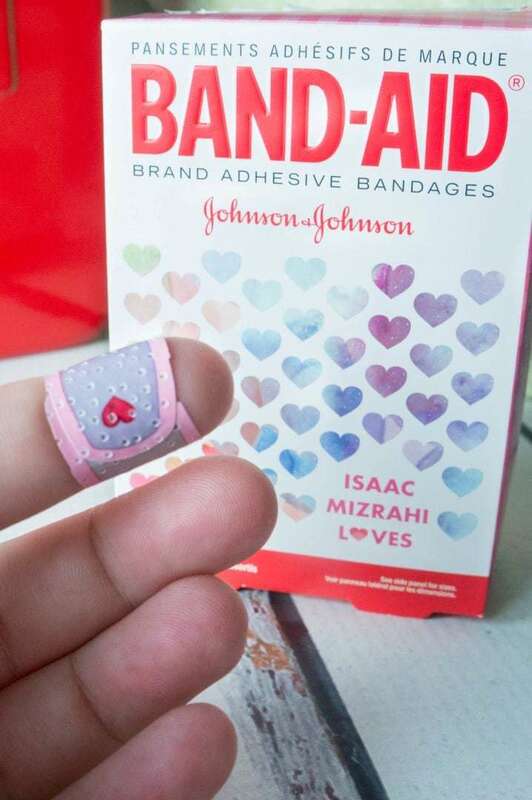 BAND-AID® BRAND just released a new gorgeous set of bandages featuring Isaac Mizrahi prints with hearts, watercolors, stripes, flowers, and other adorable prints! 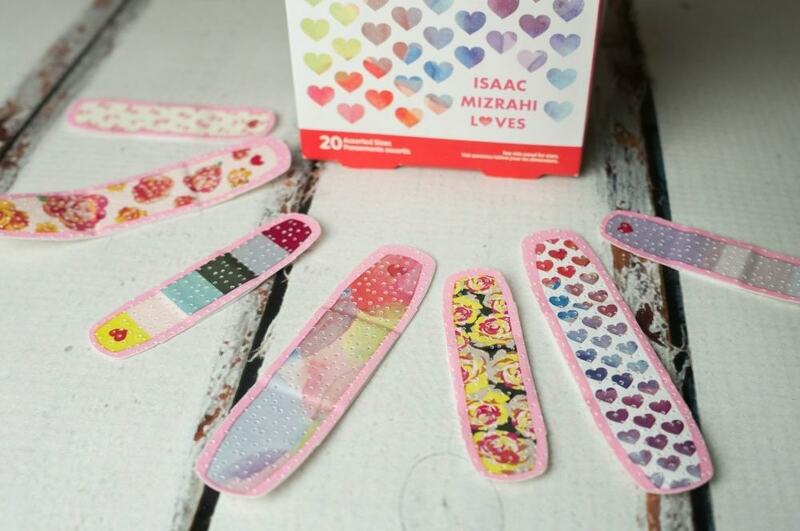 Aren’t these BAND-AID® bandages adorable? They are totally cute enough prints that even I’d want to sport one with a cute manicure to cover a ripped fingernail. The styles are perfect for little girls that love all things pink and hearts! 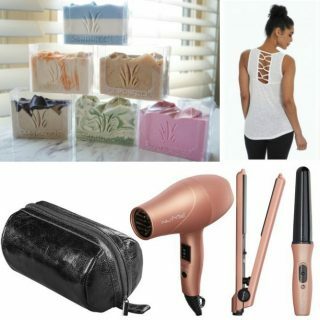 The new style is available at Walgreens and Walgreens.com at a retail price of $2.99. This is literally a five minute project once you have all your sewing supplies out and ready to go. For me, that always seems to take some effort just to pull out my gear and get started. Once you see how easy this cute Boo Boo Bag is to make, though, you’ll want to make several as gifts and to keep around your home! Start by cutting your fabric. For small kids, I like to cut two coordinating pieces of flannel into 6.5″ squares. 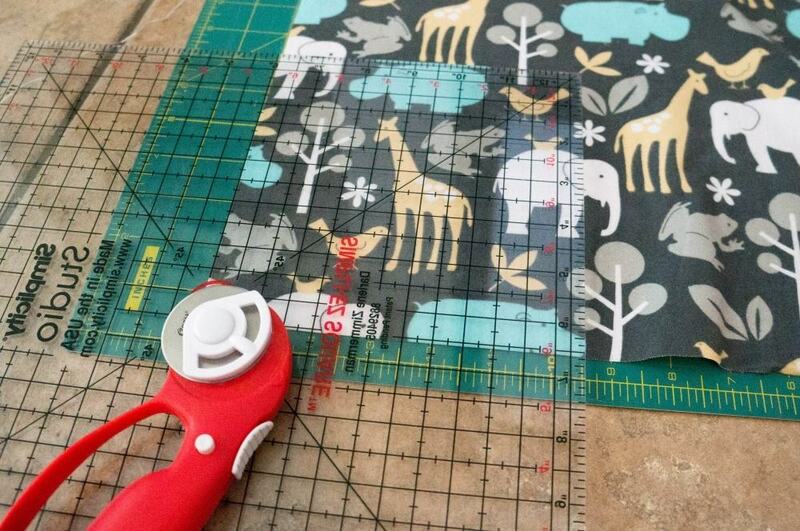 I have a rotary cutter and square guide from making rag quilts, so that makes it’s super fast and easy, but you can use a measuring tape and sewing scissors if that’s all you have. Cutting to 6.5″ gives me a 1/4″ selvage edge all around the boo boo bag. Next, put the right sides together, your pretty patterned sides facing each other. 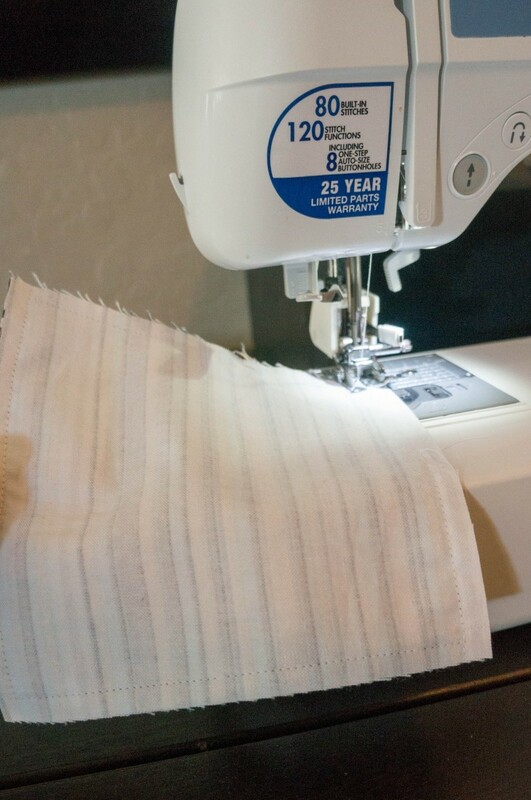 Then, start at your bottom edge of the boo boo bag about the middle and sew a straight stitch all the way around pausing and turning your fabric just before you reach the corners. When you get back to the side you started at, stop before you reach where you began leaving about a 2″ opening. Flip your fabric right side out by pushing the inside of the bag out through the hole you left in the fabric. Just keep pushing until it’s all the way flipped. Next, grab a small scrap of paper and roll it so that one end is small enough to fit into your boo boo bags and the other end opens up wide creating a funnel. 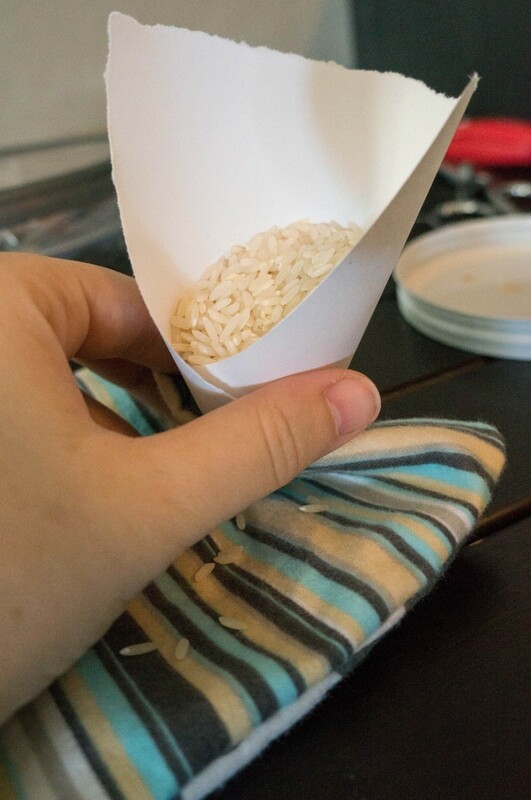 Next, pour in rice into your funnel and let it fill up your bag. Fill the bag about 2/3 of the way full, you want to leave room for the rice to move around and not be stiff when in use. I used about a cup and a half of rice, but I didn’t measure, just pour some rice in until it feels about right – still flexible but enough to fill the bag if laid flat. If you want to add any scents like lavender or eucalyptus to add a soothing scent, you can just drop in a drop or two of essential oils onto the rice now. Finally, squish all the rice down to the farthest edge away from your hole and stitch up your hole. You can do a hand stitch for this part if you want to just grab the hole. I just did two rows straight down the entire edge for ease and to secure the edge from spills. That’s it, that’s all there is to it! Your boo boo bag is now ready to use! For Heat: Place the boo boo bag in the microwave and heat for 30-45 seconds. Young kids will only need about 30 seconds so it’s warm but not hot. For Cold: Put the boo boo bag inside a freezer safe ziploc bag and freeze. You don’t have to freeze overnight to start using it, a little bit of cold goes a long way! My youngest hit his knee on the counter trying to climb up and a simple BAND-AID® BRAND bandage and boo boo bag did the trick to make him happy again! Of course, after he was feeling better, “baby” had an ouchie next! He no longer needed these two comfort items but loved being able to comfort his baby doll who was obviously in pain. I loved watching him interact with his baby and show compassion and love to him. It’s been a great tool to show us what he’s been thinking about and feeling himself as he cares for his baby. Today, baby even took a turn sitting on the potty! 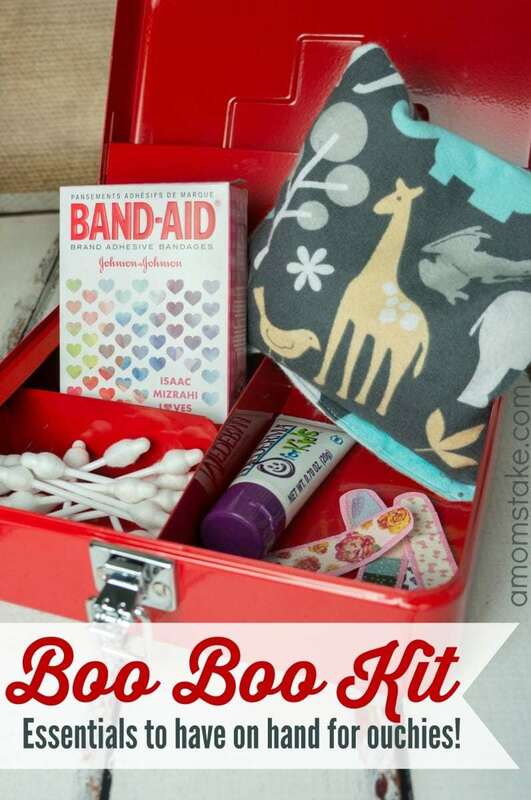 What would you add to a Boo Boo Essentials kit? I love these! My sister made me some a while back. I didn’t think to freeze them for a cold pack. I would love to make some of these myself. We have Neosporin in our boo boo bag. But have to have Band-Aids for sure!! Not being a mom, it took me a minute to figure out what a “boo bag” was, LOL! Now I see and it a genious idea! Those boo boo bags are super cute! And I love the designs on those band-aid designs! Those are some adorable bandaids! We need to make a boo boo bag now! What a great idea. I bet it comes in handy. What a great idea. These would be fun to make and give as gifts. Thanks for the inspiration. This is such a great idea! Every little kid would love having this in their home. I feel like some kids might be getting hurt more often though 😉 At least one of mine would! Can’t wait to do this with my little ones. Thanks so much for sharing. This is fantastic! I love those bandaids too! I need to make a kit like this! 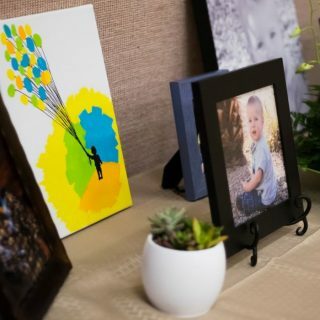 This looks like a fun project and cute idea! I’ll have to try it out for my home! This is so creative! Such a good idea too, I need to make a kit like this! 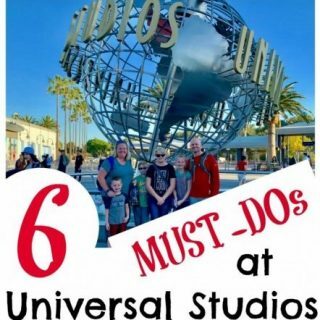 This is a great list and I’m not sure what I would add. I have an ice pack that we use that is reusable, but the Boo Boo bag would be a great addition. I love your boo boo bag. Super easy to make and very cute. I will be making a few of these for our house. I have a few of these Boo Boo bags. I have a larger one for my shoulders when the muscles are sore. Works great every time. It is a great idea to have a safety kit prepared for emergency’s. Those are great items to have on hand. I love your little boo boo kit! This is not only adorable, but also very useful. I could have greatly used this when my daughter was little. Awwww, what a cute idea! I’m sure those boo boos will feel better really fast with such cute band aids and the boo boo pack! A boo boo kit is a great idea. I always have band-aids and neosporin in the house. Aww. 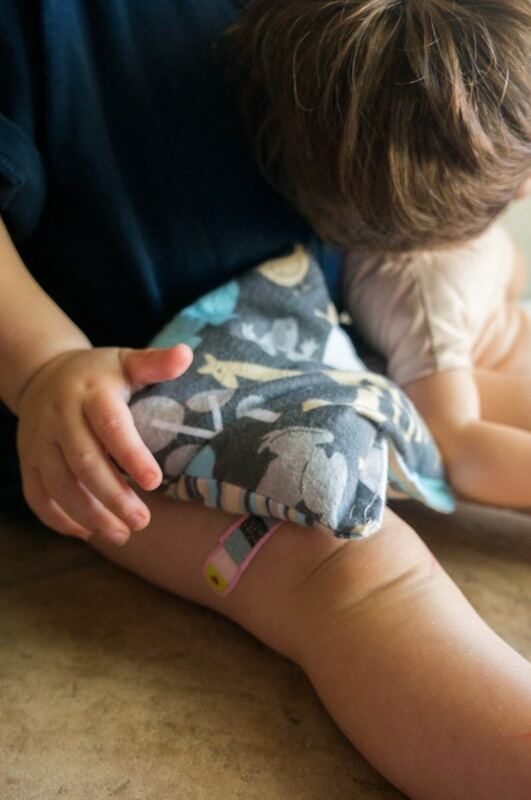 That’s a great boo boo kit and love the idea of a smaller rice bag for boo boos. We have a boo-boo kit for the girls. They go through some band-aids! I love your boo-boo bags! 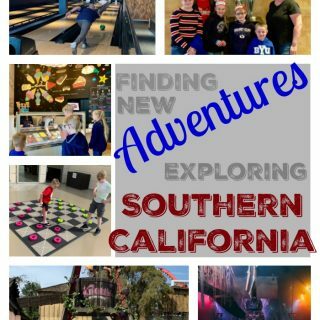 You should come link this post up with us tomorrow for the Create Link Inspire party! Thanks for the boo boo bag tutorial, I’ve always loved those when other people made them for me but never knew how to make them myself. I love the patterns on these band aids, too! So cute. I have a Boo Boo and it’s the BEST!!! I need to make another one.. wish I knew how to use a sewing machine.. would make it a lot faster. Such a cute boo boo bag. We always just put rice in a sock, but yours is so much more fun! How cute is this?! I love the Boo Boo bags. What a cute idea! I have never thought of that! Even better than you can customize them to your child! Thanks for sharing! I have one of these but it’s not in cutesy fabric like that. I need to make another. With all boys in the house, Band-Aids are an essential item for us. We go through a lot of them! What a creative and helpful idea! I love this idea! It will make kids feel better knowing that they have a Boo Boo bag close by when they get an ouchie! wow, it’s so cute. Like this creative idea. I will sure soon make a kit like this. This is such a great idea! I need to make a kit like this! 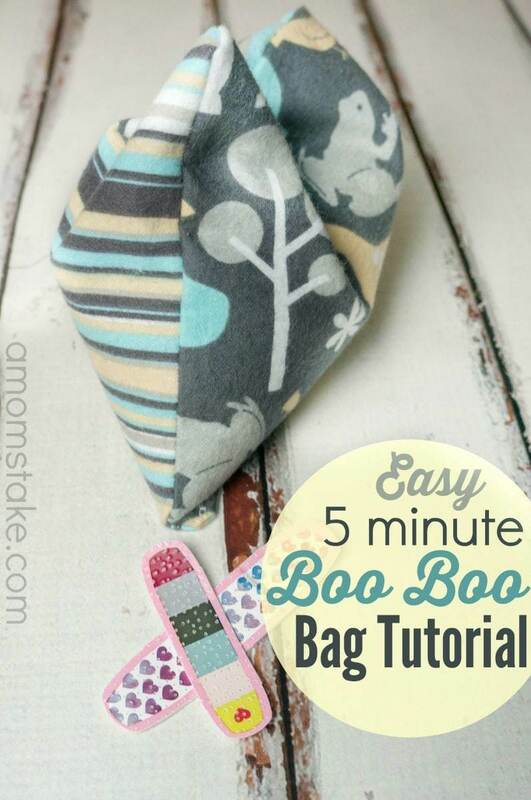 These Boo Boo bags are such a great idea to keep on hand, they really do help and work wonders. Love! !